Home / Archangel Pendants / Archangel Michael Necklace. For Protection & Strength. Truth. Courage. Strength. Protection. Victory. This magnificent Archangel Michael Pendant necklace, and 12 glorious gemstones, Iolite, Topaz, Aquamarine, Kyanite, Turquoise and Lapis Lazuli will energetically support and magnify all Archangel Michael’s attributes of courage, strength and protection. 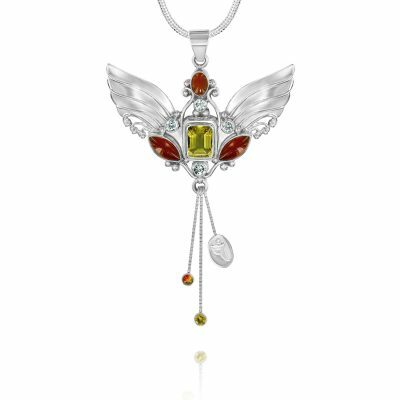 About Archangel Michael Necklace, Angel Jewellery. 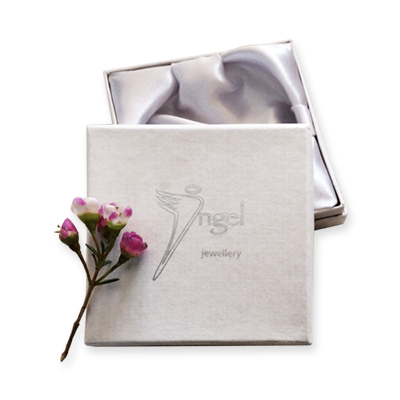 The Archangel Michael necklace comes to you in our lovely presentation box with a printout describing the gemstones I use and comes ready to wear with a chain included. 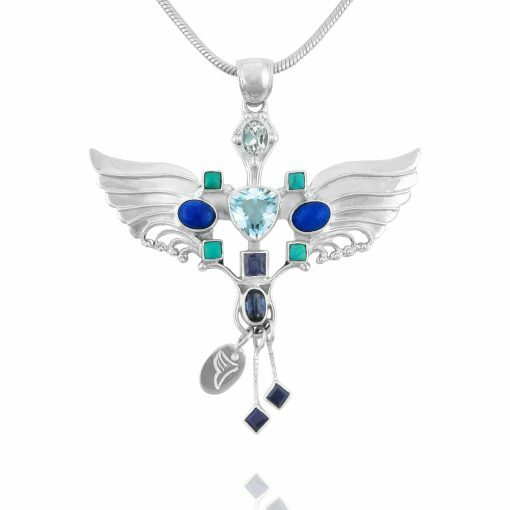 The Pendant is set with 6 varieties of glorious gemstones; Iolite,Topaz, Aquamarine, Kyanite,Turquoise and Lapis Lazuli which energetically help to support and magnify all the Archangel’s attributes to align our vibration more and more with his own. Necklace length; 23.7cm. (I can supply a longer chain if required) Pendant size; 7cm x 5.7cm. Archangel Michael is an exceptionally strong angel who protects us from danger and defends those who ask for his assistance. He is powerfully aligned with truth, courage and justice and can be relied upon to defend these principles when his assistance is sought. His energy is most apparent when he protects and guides people who are facing challenges of a personal or spiritual nature and can be of great comfort generally to anyone in need of support no matter what the situation. 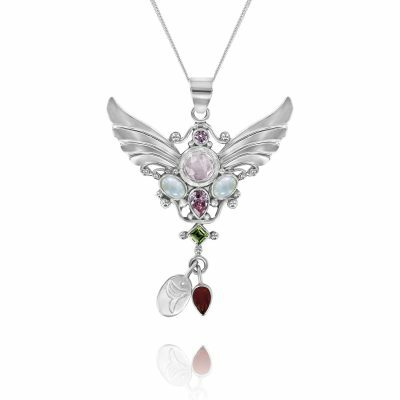 The Archangel Michael necklace is a valuable connective tool for those who work with the Archangel for healing, channelling and protection. If you’d like to know more about the gemstones I’ve used in this pendant come over here for some great information. How Can Archangel Michael Help You? Archangel Michael has been God’s representative on Earth long before people populated the planet. His job is to see that our human/divine life missions are fulfilled. Michael takes note of the things that are truly important to you helping you, and everyone else, know the purpose of your life. He will guide you step by step and help you make important decisions and life changes. Archangel Michael guards against all the effects of fear and fear-based energies and will encourage us to stand firm against crimes of violence and hatred. Another aspect of Archangel Michael is to protect our reputations against character defamation by gossip and rumor. You can also ask him to shield and protect your material possessions, your home and your car. Ask his protection to include your loved ones and those who are travelling. If you’d like to know more about the gemstones I’ve used to make this Archangel come over here. 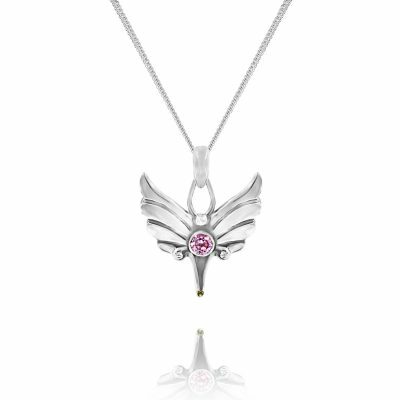 5 reviews for Archangel Michael Necklace. For Protection & Strength. 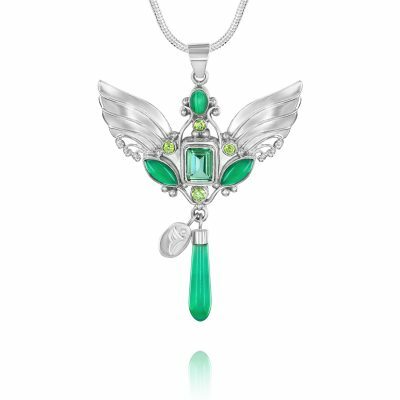 This is the most glorious pendant!! Apart from being beautiful, the energy of it feels amazing! I love wearing it and feeling that connection on a physical and spiritual level to Archangel Michael. Thank you Linda so much for the wonderful work that you do – you can literally feel the love that went into making this beautiful piece. I received my necklaces (Archangel Zadkiel and Michael) today. I must say they are beautiful. The artistry of the designs, and the quality of the stones and sliver, are truly breathtaking. I love the quality of the chains as well. I am really glad I acquired both pieces. They are one of kind designs. Thank you so much. I purchased the Archangel Michael for my wife for Christmas last year. She only takes it off to sleep! She is a Mental Health Counselor for a state prison and thus is surrounded by low energy constantly at work. She loves St. Michael, since wearing it she has felt safe and more relaxed. Archangel Raphael is a healer and she has been wishing she had that pendant also. So “surprise” this Christmas your lovely pendant will be waiting for her! Your craftsmanship is just fantastic and your jewelry is a great value for the price. Wonderful quality. You have a nice Christmas season yourself! Thanks for all your help Linda, and exquisite workmanship! 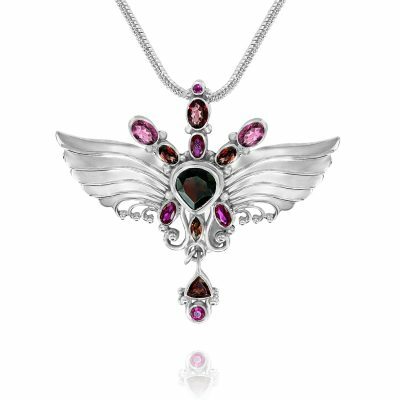 We love your angel pendant and will be purchasing more in the future from you. Many thanks. We spoke on the phone and the service was without fault. 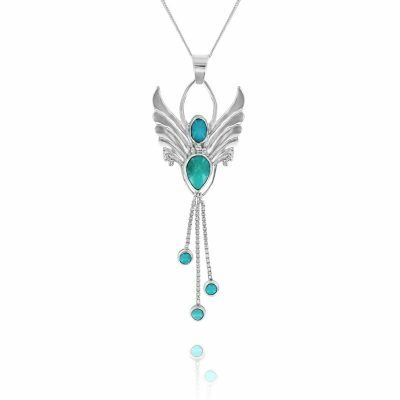 Linda went to great lengths to make sure it arrived for my birthday and what a super surprise…Michael Archangel necklace has a powerful energy that I felt right away. Absolutely love it and love wearing for protection it when I’m giving readings. Now I want Raphael too! !